The Cheese Challenge: Is It Okay To Throw Cheese At Your Dog’s Face? If you’ve spent any time on social media lately, you’ve probably heard of the Cheese Challenge. Some people started throwing slices of cheese at their babies’ faces and recording the reactions. So the next step, of course, was for people to start throwing cheese at their dogs. Like most internet trends, the Cheese Challenge is pretty silly. But at least this one doesn’t seem to be hurting anyone. However, if you take a look at the comments under some videos of dogs getting cheese slapped on their faces, you’ll notice at least a few people claiming that it’s mean. Some even call it downright abuse. So is it okay to throw cheese at your dog’s face and record the results for the Cheese Challenge? Is It Mean To Throw Cheese At Your Dog’s Face? When you throw cheese at your dog’s face, you’re probably going to get a reaction. For most dogs, the reaction is confusion, maybe some concern, then delight at finding out they have a tasty treat on their face. Nothing too harmful about that, right? In fact, challenging your dog with a new situation, even a silly one, can provide a little mental stimulation and relieve some boredom. This is especially true if they get a nice reward afterward. The challenge for them will probably be getting the cheese off of their face and into their mouth. However, not all dogs are going to appreciate a mysterious yellow square flying at their faces out of the blue. 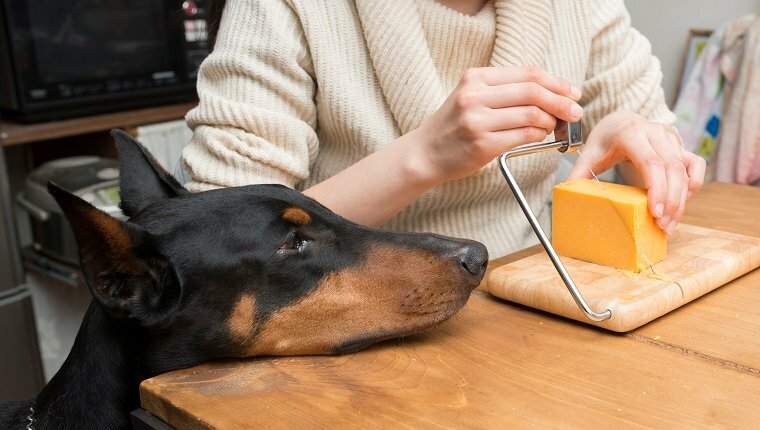 If your dog is easily startled, suffers from anxiety, absolutely does not like items placed near their face, or won’t tolerate having their vision disrupted without warning, then the Cheese Challenge is not for them. Do NOT force your dog into a situation where you’re going to cause them anxiety. They trust you. You’re the one who brings them comfort. Don’t betray that trust for an internet prank. Also, if your dog is the type to bolt when startled, you especially should not throw items, even treats, at them, especially ones that could cover their eyes. They could run blindly into something that might hurt them. And don’t WHIP the cheese at your dog’s face! Come on. You may not hurt them, but a gentle toss will do. If your dog can handle a minor prank that results in them getting a treat, maybe you’re not too worried about whether or not the Cheese Challenge is mean. Instead, maybe you’re worried about whether or not cheese is good for dogs at all. Most dogs can eat a bit of cheese and feel fine afterwards. Of course, some dogs are lactose intolerant, just like some people are. If you’re not sure if your dog is lactose intolerant, it’s best to try small amounts of cheese at first to see how they can handle it. If they show signs of tummy troubles, avoid dairy products. That said, even dogs who are not lactose intolerant shouldn’t have a lot of cheese. It’s usually fairly high in fat, and depending on the type of cheese, it can be salty or highly-processed. In fact, the singles you might throw at your dog’s face for the Cheese Challenge are likely very processed and probably not good for humans, either. Dogs who eat too much cheese can suffer from an upset stomach or digestion issues in the short term. If they eat too much cheese over a long period of time, they can face health issues like obesity. So keep the cheese as a sometimes treat. However, in small amounts, like a single slice, your pooch will probably be just fine and enjoy the treat. If your dog has a medical condition or a specific diet, you should talk to your veterinarian before you give them cheese. Your dog’s size might also affect how much cheese they can eat. If you have a small pup, maybe stick to a half slice for the Cheese Challenge. Bottom Line: Should You Throw Cheese At Your Dog’s Face? Let’s be clear about this. Dogs don’t understand pranks. They won’t know why you’re doing what you’re doing. But as long as you do the Cheese Challenge–responsibly?–then your dog should be fine. Your pooch won’t get embarrassed about you uploading a video of them to social media, either. They’ll most likely just be a little confused, but happy to get a treat. This isn’t a particularly harmful internet trend, but it is pretty ridiculous. Still, if you want to participate and you can handle people crying “abuse” in the comments of your video, maybe a little dairy on your doggo is worth it. Are you participating in the Cheese Challenge? Do you think it’s mean to do to dogs? Let us know in the comments below!